We are a group of qualified, professional real estate agents with HomeSmart specializing in Arrowhead homes for sale. As Arrowhead expert Realtors, our job is to help you find and buy your perfect Arrowhead home. We understand all aspects of the neighborhoods we sell in, and what fits our client's lifestyles and desires. We take every consideration into what you want and need to take the challenge out of home buying and turn house hunting into an enjoyable experience. We will exceed your expectations. Sign-up for our "Property Alerts" and newsletter to keep informed of the latest new home listings of Arrowhead homes for sale before they're gone. Are you looking for homes for sale in Arrowhead? Contemplating a move to Glendale, Arizona? You will want to consider the beautiful area of Arrowhead Ranch. Start your property search here for Arrowhead homes for sale. Arrowhead is located in Northwest Glendale, Arizona. Arrowhead is an upscale community with homes ranging in value from $150,000 to over $1,000,000. Whether you have a young family, are a retiree, or somewhere in-between, Arrowhead offers great home and community options. The homes for sale in Arrowhead sell very quickly. Sign up for “Property Alerts” now so you don’t miss out on your dream home! Outdoors is the place to be in Arrowhead with many golf courses and lake community homes. Outdoor enthusiasts will enjoy the miles of hiking trails available as well as many parks within walking distance of your Arrowhead home. Communities in Arrowhead include Arrowhead Ranch and Arrowhead Lakes. Most Arrowhead homes for sale have a classic southwest look with light colored stucco and tile roofs. There are new homes currently under constructed in Glendale by home builders such as D.R. Horton, K. Hovnanian, and Beazer Homes. If your property is one of the homes for sale in Arrowhead, you know it’s one of the best communities in Arizona in which to live. Glendale has more than 450 restaurants, upscale and family-friendly hotels, and has a dynamic cultural scene. The community of Arrowhead is unlike any other in Arizona. Located in the affluent northern portion of Glendale, AZ., Arrowhead is an upscale master planned community at the foothills of the Thunderbird Mountain Preserve. 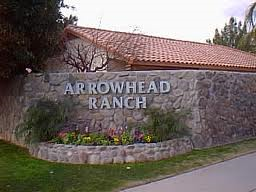 Arrowhead Lakes and Arrowhead Ranch feature golf course and lakeside homes of diverse styles and sizes ranging from the $150,000 to over $1,000,000. AZCentral.com voted Arrowhead as a "Best" neighborhood in 2008 due to its proximity to freeways, exceptional golf courses, 8 area lakes, beautiful parks and hiking trails. Just many reasons to check out the Arrowhead homes for sale! Arrowhead has the security and friendliness of a small town community with all the luxury and conveniences of a big city. Access to education, quality healthcare, lifestyle options and entertainment are all important factors to consider in your home search. Arrowhead and the City of Glendale offer great quality education including the "A" rated Deer Valley School District, private and charter schools, ASU West Campus and Thunderbird School of Global Management to name a few. Arrowhead is conveniently located near Banner Thunderbird Medical Center, Arrowhead Hospital and the prestigious Mayo Clinic Family Care Center. Glendale has all the elements of a great shopping experience being listed as a "Top Ten" by USA Today & Sunset Magazines. Some favorite areas are Glendale's Historic Downtown and the beautifully designed Arrowhead Towne Center. This large regional mall draws people with its variety of shopping, movie theater and restaurants. Did you know Glendale is also a culinary destination featuring ethnic eateries, a candy factory, food festivals, and nationally recognized restaurants? Arrowhead is minutes from Westgate City Center and Jobing.com Arena, home to the NHL Phoenix Coyotes, popular concerts and events. University of Phoenix Stadium is also nearby and home to our NFL Arizona Cardinals, the 2008 Super Bowl, the Fiesta Bowl and 2015 Super Bowl! With so many conveniences and activities, Arrowhead is a truly multigenerational location. Are you ready to add your property to the homes for sale in Arrowhead? Let Arrowhead Homes for Sale be your top resource to connect you with buyers who want exactly what you have. Please contact me to start searching for or selling your Arrowhead home today. A great reason to move to Arrowhead is its proximity to everything! Arrowhead Towne Center is a large mall with several anchor stores including Dillard’s, Macy's, Robinsons, JC Penney’s and Sears. Arrowhead’s Entertainment District offers many casual to elegant restaurants. There are also movie theatres, bowling alleys and plenty of entertainment which makes living in Arrowhead an exciting place to live in Arizona. Just minutes from Arrowhead is the University of Phoenix Stadium, home of the Arizona Cardinals and Jobing.com Arena, home of Phoenix Coyotes Hockey. Glendale’s Sports and Entertainment District is Arizona’s professional sports hub. Glendale will also host the 2015 Super Bowl! The West Valley provides Cactus League Spring Training in several locations. There is always something to do in Glendale. Historic Downtown Glendale is constantly holding special events such as Glendale Glitters, Glendale Chocolate Affair and the Olde Towne Glendale Cruise and Car Show. Arrowhead is in the A rated, Deer Valley Unified School District but also offers proximity to Charter and Private schools. Higher Education opportunities at Arizona State University’s West campus, Thunderbird School of Global Management, Midwestern University, and Glendale Community College also make Arrowhead a desirable place to buy your new home. An important consideration in your searching for Arrowhead Homes for Sale should also be the community’s proximity to quality healthcare. The two major hospitals within minutes of Arrowhead are Banner Thunderbird Medical Center and Arrowhead Hospital. There are also many top rated specialty doctors nearby. If you are buying or selling in Arrowhead, We are Realtors you will want on your side. As experts in the Arrowhead area, we can quickly help you pinpoint the neighborhoods that fit you and your family’s lifestyle best. And when you are ready to sell, we know buyers who want exactly what your home has to offer.